This may be one of the few times you see the Senate’s Republican Minority Leader, Mitch McConnell of Kentucky, praised on the pages of CHQ – but right now he is running a tough and professional campaign against a strong challenger. And it appears McConnell is beginning to open a lead against this strong challenge not because he is outspending Alison Lundergan Grimes, but because he is campaigning on the issues that matter to conservatives. We contrast that with North Carolina Republican challenger Thom Tillis, who by rights should be running away with the race in his campaign to unseat Democratic Senator Kay Hagan. Tillis has struggled to keep up with Hagan in spending and in the polls largely because he is stuck in the DC consultant “prevent defense” campaign of the Republican establishment. You can really see why Thom Tillis is losing and Mitch McConnell is winning just by comparing their websites. For most of the campaign there's not been been much on the Tillis website. It's amateur. And there’s nothing in opposition to the Democrat’s plan to grant amnesty to millions of illegal aliens. Indeed, there’s nothing at all about immigration or border security on Tillis’ website. McConnell's website is packed with videos of all the great ads he's running against Grimes. McConnell is running a tough professional campaign. From looking at his website I can't tell what Thom Tillis is doing, but whatever it is it isn’t working because the polls show him behind in a race he should be winning. 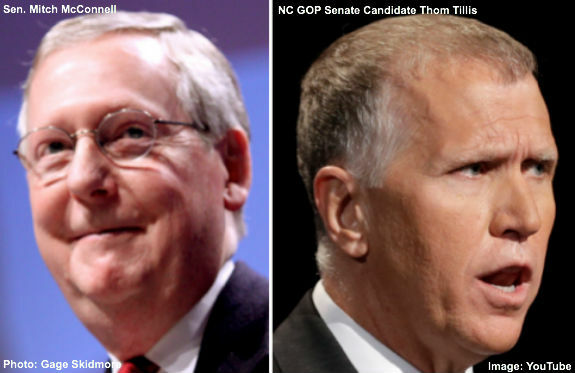 Tillis might end up being the only Republican who loses who should win. And if he loses, it will be because instead of campaigning on the issues that really move voters, national security, opposition to amnesty for illegal aliens and ending Obama’s culture of lies, lawlessness and corruption, Tillis has been stuck campaigning to Hagan’s strengths on such things as increasing education spending and other issues far afield from what is at the top of mind for voters going into the November 4 election. Submitted by chaplainpumc on Thu, 10/02/2014 - 13:11. Grimes never saw an abortion she didn't think was ok.
Any conservative who wants her to topple McConnell is consumed with irrational anger. Submitted by HW on Wed, 10/01/2014 - 15:17. Submitted by CrustyOldGeezer on Wed, 10/01/2014 - 13:19.
too bad mcconnell isn't capable of backing up his 'conservative values' with ACTIONS instead of 'compromising' everything of value this nation has in order to appease those who work tirelessly to destroy what little is left.